While the frequent flyer miles may be piling up with relative ease as FC Barcelona prepare for their second trip to the Basque Country in a fortnight, Thursday night’s Copa del Rey quarterfinal first-leg clash at Real Sociedad presents a bevy of challenges they’ll need to overcome to continue down the path to a third straight championship. The Catalans, however, will be up against more than just a determined opponent — they will also be facing the crisp coastal weather and history itself when they brave San Sebastián’s cold and humid Atlantic climate to confront a notoriously tenacious rival whose home grounds at Anoeta have been a staggeringly tough nut to crack in recent seasons, regardless of the competition. But don’t expect any of that to faze Barça, who are in top form as of late and harbor every intention of marching through to the semifinals — and continuing to write their own history. Wednesday’s workout took place on Catalonia’s coldest morning of the new year, when manager Luis Enrique Martínez had all players on hand to train in temperatures that had just swooped down from Siberia overnight, offering them a final chance to acclimatize themselves to the frigid night air expected in the north of Spain. In the wake of Wednesday’s session, the coaching staff made public the list of players who will be travelling to San Sebastián. Central defender Gerard Piqué returns to the squad after resting for Saturday’s 5–0 victory over Las Palmas, while goalkeeper Marc-André ter Stegen has been granted a rest-day himself. Rafinha is out with a hamstring injury. Luis Enrique told the media Wednesday that he and his players were cognizant of the formidable obstacle a midwinter mix-up at Anoeta represented, while expressing confidence in Barça’s ability to buck a less-than-desirable trend that hasn’t yielded a win there since a 2–0 La Liga triumph in Week 33 of the 2006/07 season. Nevertheless, he declared, with his trademark gravitas, “the day we win at Anoeta is drawing ever closer." The Catalans are coming off back-to-back near pitch-perfect performances at Camp Nou, the first of which was a 3–1 win over Athletic Club (Highlights below, Match Report) a week ago that completed an aggregate comeback victory and knocked Los Leones out of the tournament. Barça seconded that act by cruising to a flawless 5–0 rout of Las Palmas (Highlights, Match Report) in La Liga on Saturday. 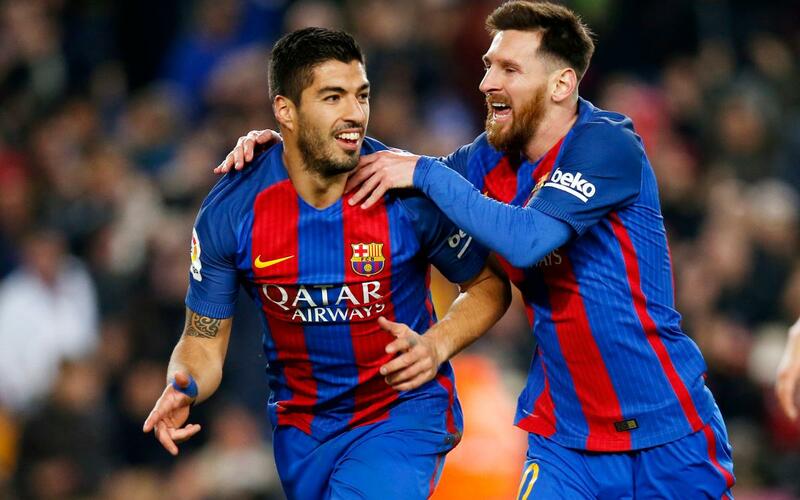 Barça, however, are still searching for their first road triumph of the new year, after opening 2017 with a 2–1 defeat in Bilbao in the first leg of the last 16 followed by a 1–1 draw at Villarreal just three days later in La Liga. Curiously, Real Sociedad qualified for the quarterfinals by knocking out Villarreal with a 3–1 first-leg win at Anoeta and a 1–1 draw at El Madrigal just three days after Barça’s league match there produced the same result. In Real’s last home game, however, they were unceremoniously vanquished, 4–0, by visiting Sevilla in La Liga. Barça and Real have met four previous times in the Copa del Rey. The first three clashes were all title matches — with Barça winning all three — in 1927/28, 1950/51, and 1987/88. They also met in the semifinals of the 2013/14 edition, when Barça went through on the back of a 2–0 first-leg win at Camp Nou followed by a 1–1 draw in the return leg at Anoeta. No matter where you are in the world we have you covered. You can also listen to live play-by-play streamed in English on Radio Barça, as well as follow our exclusive, minute-by-minute updates on FC Barcelona's official English language Twitter account as the action unfolds. Don't miss it!